The travel expenses will be supported to young scientists outside of Japan. 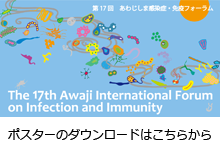 Applicants should send their CV, an abstract of their poster presentation (about 250 words including the title, names and affiliations of all authors) and a recommendation letter from the research supervisor or the department head by the end of JuneJune 22nd to AIFII 17 Secretariat (aifii2018@aeplan.co.jp). The amount of the bursary will be approximately JPY 50,000 (e.g. Asia) ~ 150,000 (e.g. Africa). * Please note that Japanese scientists outside of Japan and foreign scientists in Japan are ineligible.